The Real estate (Regulation and Development) Act, 2016 came into force with the purpose of regulating the Real Estate sector. 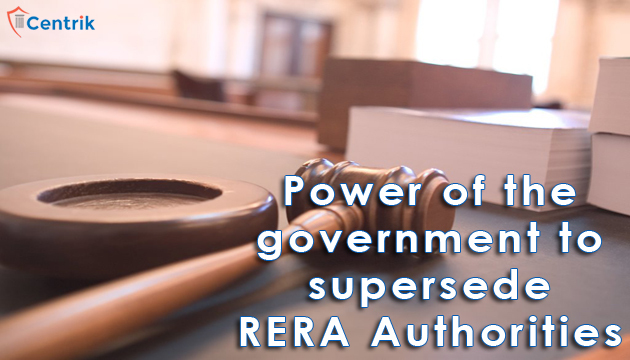 In order to execute the RERA provisions every State had to establish the RERA Authorities, most of the States have established the Real Estate Regulatory Authority but still, there are some States which are lacking behind and now trying to take a pace. But even after the 2 years, there are many lacunas wherein the authorities are not aligning their functions as per the preamble of the Act. In many States without looking at the grievance of the home-buyer, the RERA Authorities are giving orders which are not up to the expectations. If the project is 50% completed they are not giving the refund to the home-buyers, no matter how long their money was stuck with the builder. Looking up for such things the government should exercise its powers of superseding the Authority. Section 82 of the Act provides that if any time if the government is of the opinion that the circumstances are beyond the control of the Authority, and the Authority is unable to discharge the functions or perform the duties imposed on it by the Act; or if the Authority is regularly defaulting in complying with any direction given by the Government and such default effects the financial or administration position of the Authority or that there are circumstances exist which render in the public interest the government by may, by way of notification supersede the Authority but only for the period of 6 months by appointing a person or persons as the President to exercise powers and discharge functions as the RERA Authority. In case the government issues the notification of superseding the Authority it shall give a reasonable opportunity to the Authority to make representations against the notification. Once the notification of supersession has been issued and published by the government then the existing the Composition of the Authority must be dissolved by vacating the office by chairperson and members and the powers functions and duties as per the provisions of the act must be discharged by the appointed person for supersession. After the expiry of the period as mentioned in the notification the government shall reconstitute the Authority by fresh appointment of chairperson and members. The government is also having the powers to issue directions to the Authority and obtain reports and returns. The government has a power under Section 83 of the Act to question the policies framed by the Authority and in case there is a dispute regarding the policy between the authority and the government the stand of government shall be deemed final. The authority shall furnish the returns and other information with respect to the working of the Authority from time to time. Looking at this arrangement of the Act we are under the opinion that the Government should keep a regular check on the authority by reviewing the policies and the conduct of the Authorities and in case there are some irregularities found the government should take over the Authority and bring it back on the track.